It is spring and my thoughts turn to working in the garden. My garden includes beds of perennials, colorful shrubs, many trees, vines, and soon several annuals that I simply must have. It may seem that flower gardens have always been important. That is not the case. What has always been important is survival. In most cultures gardens filled with flowers only appeared after a long stretch of time devoted to farming that made available the food needed for the family table. If you think about the beginning of our own country, a similar situation occurred. Thomas Jefferson thought the whole country was to be built on the role of the farmer who worked the soil to provide for a family. Throughout the late eighteenth century and the first half of the nineteenth century, there was little time for pleasure gardens, or gardens of flowers. Most people were simply trying to survive. Thus any working with the soil centered on agriculture. 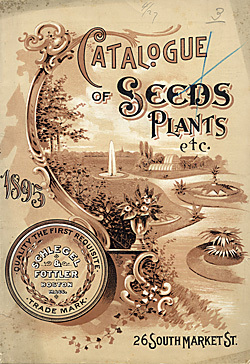 Most early American garden magazines emphasized the progress of farming. Certainly we know during this time gardeners grew some flowers, but that was not the focus for a home garden. It was not until after 1850 that we saw the growth of flower gardens with the emergence of seed companies who had flower seeds to sell. Thus their customers could add a touch of beauty to the home landscape. Rochester, New York seed company owner James Vick (1818-1882) wrote in 1878, “To any who can look back a quarter of a century, the increase of a love of flowers and their cultivation within that time seems almost marvelous. “Twenty-five years ago a ‘laylock’ or two, a red ‘piney’ on either side of the front door, a few straggling, untrimmed rose bushes, and, perhaps, half-a-dozen bunches of the old-fashioned yellow Day Lily, constituted the floral adornments of even the most pretentious country homes. Among the ruins of the city of Pompeii, near Naples, I was impressed with evidence of how people cultivated trees, shrubs, and flowers. What amazed me was that Pompeii, a colony of Rome by the time of its destruction in A. D. 79, knew and appreciated horticulture quite early. It was a time when many other cultures avoided even depicting something as simple as a flower because that was what pagans did, they claimed, especially in their rites of idolatry. Muslims, Christians, and Jews avoided any link to pagan practices. That seems strange because eventually Christianity adapted pagan rituals and holidays, reinterpreting them for the spread of the faith. The celebration of Christmas is a good example. 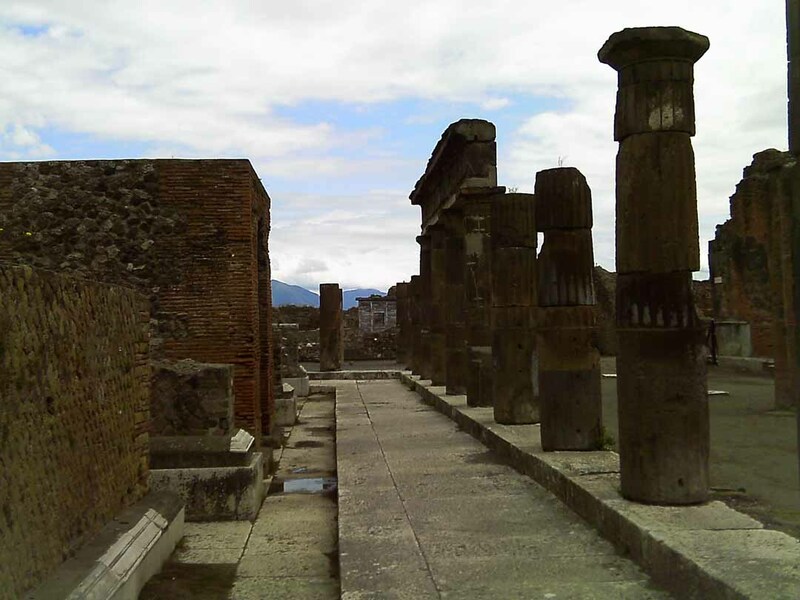 The streets of Pompeii are still there, as well as images of plants in frescoes that I saw in some of the homes. Flowers in Pompeii provided the color in garlands worn on the head, and the scent of perfume for the body. Cultures over the centuries have used flowers according to the tenets of their moral principles. The Roman use of flowers, as at Pompeii, differed from other contemporary cultures both in the East and the West. Eighteenth century English landscape garden included flowers. The modern landscape garden began its influence on the evolution of the English garden in the early eighteenth century. Its distinctive features included views of a long extensive lawn, curved pathways, wooded areas, perhaps a deer park, classic buildings, and even a wild garden. Flowers were also an important part of this design tradition. Flower gardens were not generally considered a part of the picturesque or naturalistic tradition, originating in the early eighteenth century. The sweeping lawn dominated the view. 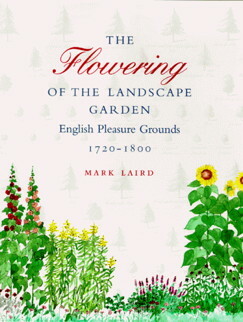 Mark Laird’s research also illustrates the importance of flowers in this early English garden. In his book The Flowering of the Landscape Garden: English Pleasure Grounds 1720-1800 Laird makes the point that flowers were an integral part of that eighteenth century picturesque tradition. John Claudius Loudon (1783-1843), prolific garden writer and a successor to both William Kent and Capability Brown in his role as England’s premier landscape gardener, practiced a landscape design with a picturesque look that also included flowers. Throughout his designs, beginning at Scone in Scotland, Loudon advocated for flowerbeds in the landscape. In the mid-nineteenth century American nurseryman and landscape designer Andrew Jackson Downing proposed Loudon’s landscape design, including, of course, flowers as part of the landscape. Plants enter our gardens usually through the portal of the green industry like seed companies, nurseries, and growers. That was the case with the dahlia. 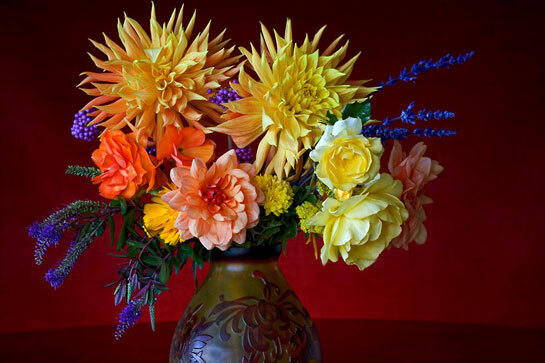 Originally from Mexico, the dahlias appeared in Spain in the eighteenth century. The dahlia reached England in 1803, and America a few years later. 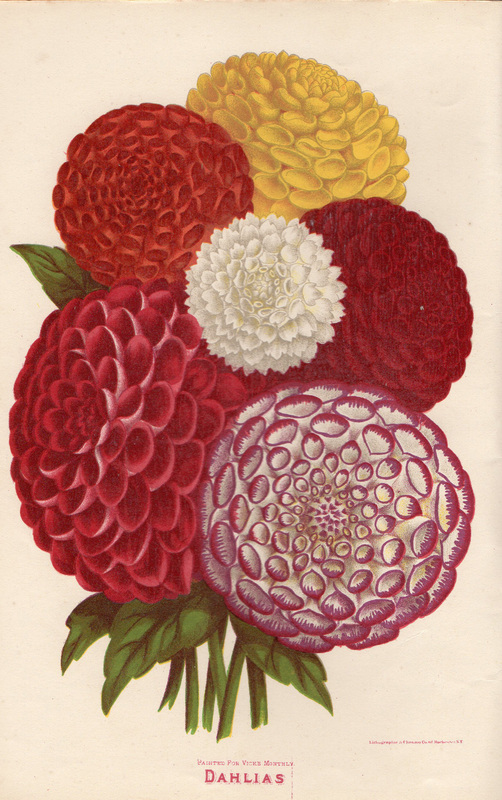 Hovey won Best in Class I for his twenty-five dissimilar dahlia blooms at the Flower Show sponsored by the Massachusetts Horticultural Society on Saturday, October 1, 1842. Thus his writing about the plant and also growing it, and, of course, selling it contributed to gardeners planting it in the garden. Hovey was only one of the early nurserymen to encourage the dahlia. Today we have a company like American Meadows which still encourages gardeners to grow dahlias. This image [below] is from the AM company website. American dahlia growers can stand up to the best. Today there are 57,000 varieties of the dahlia. This flower has come a long way, with no small thanks to the American nursery business. This must be the summer of all things Celia Thaxter (1835-1894). Earlier this summer I posted here about her biography that I had just read. Then I wrote about the wonderful Childe Hassan (1859-1935) exhibit at the Peabody Essex Museum in Salem, Mass. Recently I saw another exhibit about Celia in the same city. 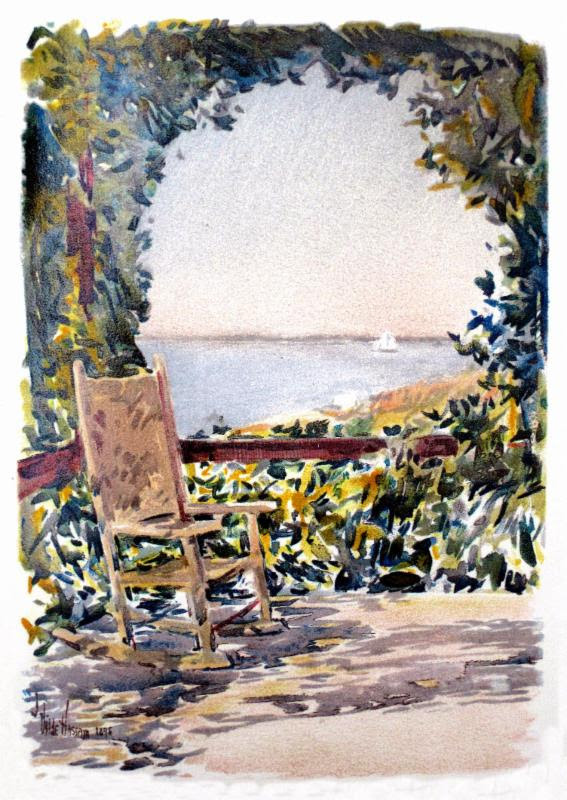 The Salem Athenaeum is hosting a free exhibit called “Celia’s Salon: America’s First Artists’ and Writers‘ Colony.” The exhibit runs through September 23. This is a beautiful collection of materials that illustrate the richness of Celia’s salon at her family’s hotel on Appledore Island, off the coast of Rye, New Hampshire. She invited hotel guests who also happened to be artists, musicians, and writers to spend either the morning or the evening in her salon. Some would bring their art work, musicians would play, and Celia would read at times. Childe Hassan was the leader of the American Impressionists and the most prolific and successful artist working in that style. Celia became his friend from the start of his yearly visits. Illustrations of his work also form part of this exhibit. In the collection there is a photograph of Celia, sitting in her salon. The extremely cluttered room is filled with tables covered in doilies, pictures, drawings, china artwork, even a music stand. There seems to be no room for anything else. Scene of Appledore Island used in promotion of the Exhibit at the Salem Athenaeum. The artist William Morris Hunt gave Celia lessons. She had taken up painting of pieces of china like cups, saucers, and flower vases, some of which appear here in a glass case. At that time when literati and artists filled Celia’s salon, people were also writing her, requesting her china artwork. This exhibit offers a glimpse into the life of this famous American poet and gardener from the late nineteenth century. Victorians loved their flowers. The showier, the brighter, the better. So argues Nicolette Scourse in her book The Victorians and their Flowers. The basis of that devotion to flowers stems from the view that flowers express a link to the Creator. Now that we have begun our summer adventure in the garden which, of course, includes cultivating flowers, whether perennial or annual, you see how important a role flowers play in the garden. We love our flowers today as much as the Victorians. Right now garden centers and nurseries abound in colorful selections of flowers, eager to go home with us. Flowers still impact your eyes, your nose, and even your touch. The Victorian fascination with flowers continues. Victorian seedsman taught love of flowers. His magazine Vick’s Illustrated Monthly provided the nineteenth century seedsman James Vick (1818-1882) a chance to instruct and encourage his customers. Vick was in the business of selling love of flowers. Vick himself loved growing flowers and he shared that love with his customers in his catalog and in his magazine. You know weeds are a problem for every gardener. The nineteenth century Victorians who considered cultivating flowers a reflection of the Garden of Eden in the Book of Genesis had their own view of weeds. To cultivate a flower garden therefore meant a closeness to God. All of that from growing a few flowers. In nineteenth century Victorian times you were not just growing flowers, you were showing a sense of morality and religious sentiment. So it was no surprise that weeds would be considered a result of rejecting God’s love. The nineteenth century too inherited the sentiment of an earlier Romantic period in which nature reflected the Divine within its soil, water, stone, and plant. In the nineteenth century growing flowers meant much more than a hobby, especially for women. Victorian women grew flowers because it was the moral thing to do. Growing flowers, in fact, became itself a lesson in morality. Rochester, New York seedsman James Vick (1818-1882) often wrote that the first garden was that of Adam and Even, the Garden of Paradise. Vick saw it as his job to spread floriculture, or the love of flowers, across the country, a kind of return to the first garden. 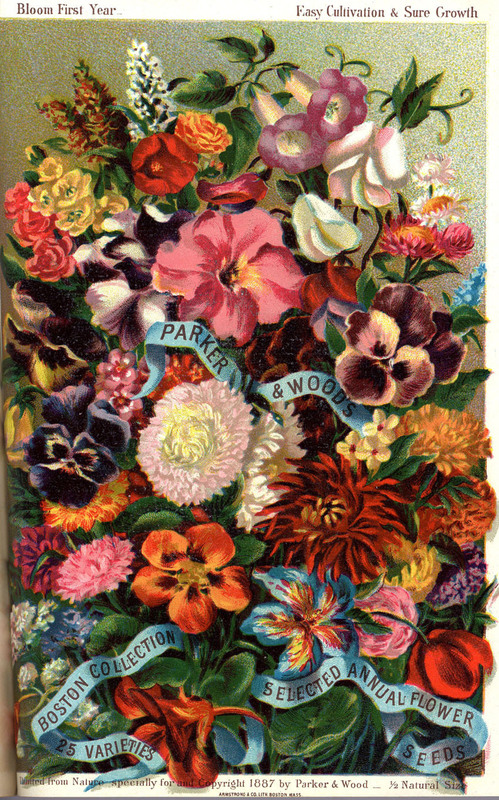 The chromolithograph [above] from the Parker and Wood seed catalog of 1887 illustrated twenty-five varieties of flowers that gardeners could grow from the company’s seeds. 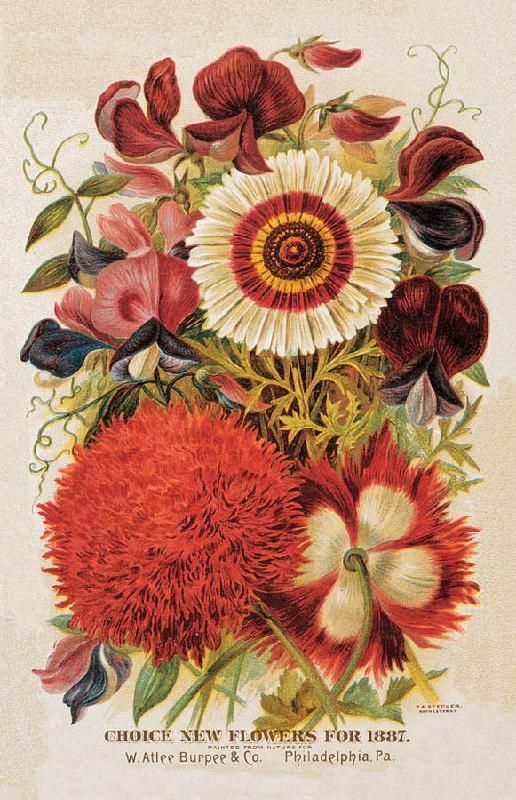 As the illustration mentioned at the bottom in the words “Painted from Nature,” it reflects the importance of flowers for the middle class Victorian gardener. 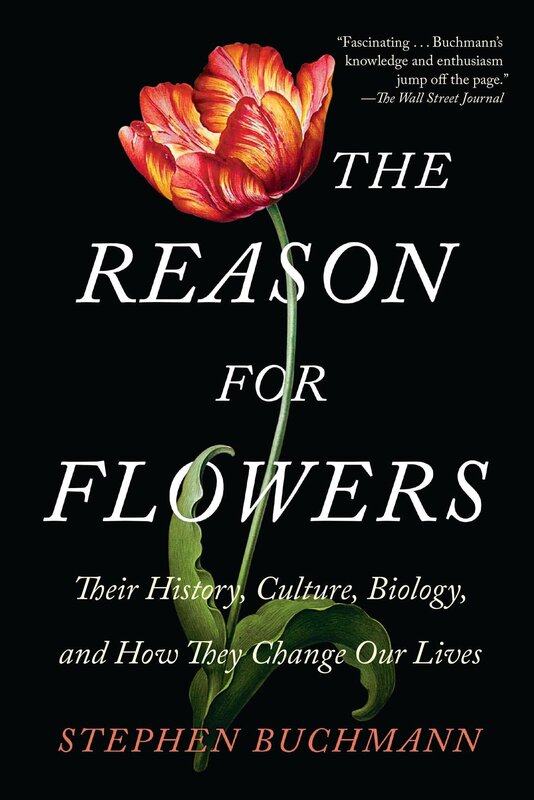 At the same time as flowers provided a lesson in morality, flowers also opened the doors of science to many, including women. People could study a flower and learn about its reproductive habits. Flowers provided lessons in biology, giving many Victorians a first hand look at how science could enable a more learned society. And to think it all rested on the humble flower.